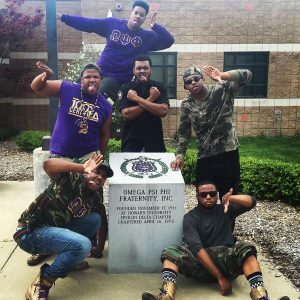 Members of the Epsilon Delta chapter of Omega Psi Phi Fraternity, Inc. pose in front of the Gaines Oldham Black Culture Center. Membership intake is the membership selection process conducted by Mizzou’s historically Black organizations, which are governed by the National Pan-Hellenic Council (NPHC). Early in the fall semester, the NPHC fraternities and sororities represented on campus present information about their individual chapters for prospective members. Each chapter will not begin its actual membership intake process until later in the academic year, as NPHC affiliated fraternities and sororities typically do not accept a student for membership until the student has completed at least 12-24 hours of college credit with a minimum GPA.